Notes: Native to Eastern North America. Plant poultice good anti-inflammatory. Makes a good tea. AGASTACHE NEPETOIDES Of the mint family. Attractive to bees and butterflies. 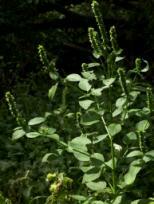 Species name is in reference to the similarity in appearance of this plant to catnip or catmint (Nepeta).